My February socks are finished! This is a two-ball stash-busting project - although I suppose they really only used about 150g of yarn. 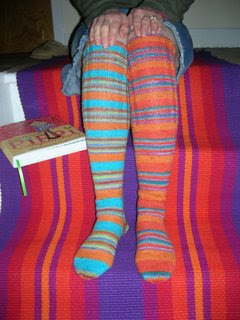 I chose two self-striping yarns from a multi-pack of On-Line Supersock "sport color" and this free pattern with 2.5mm needles. I misunderstood the shaping instructions so decreased more rapidly than I was supposed to. Even so, I think I might need to run some elastic through the top as they are slightly loose just above the knee. My First Love thinks they are crazy - especially when I have my hair in two plaits! I just plain love them! I love your socks! What a great way to perk up the Winter blahs.